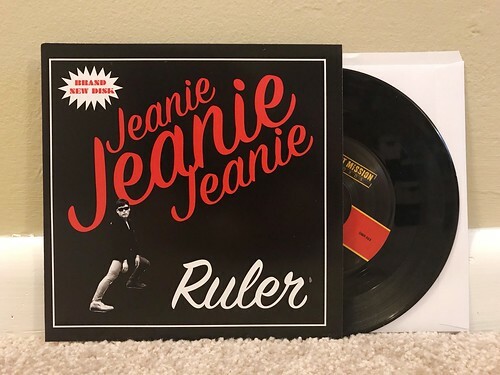 I Buy Way Too Many Records Dot Com: Ruler - Jeanie Jeanie Jeanie 7"
This is the second 7" by Ruler that Secret Mission has sent over to me. I'm really grateful that they are putting out these records as it's a window into a Japanese punk scene that I'm just not very familiar with. Sure, I know Fink from a prior band he was in, Teengenerate, but there's so much of this garage-y style rock that isn't on my radar. The first song on the 7" is "Jeanie Jeanie Jeanie." Of all the Ruler songs I've heard so far, it's probably my least favorite of the bunch. It's not a bad song, but I think the vocals are a bit off putting for me. There's a little too much growl in the delivery that distracts me from the otherwise fun guitar chugging. The B side is the sort of song that is more my speed. "(It's Not) Saturday Night" has a much more obvious power pop edge to it and the growling vocals are significantly more subdued than they are on "Jeanie." There's great stutter stops in the breaks of the verse and a really catchy chorus. This is the best song I've hear by Ruler so far and I hope I'll be able to hear more from them in this vein.